It's not true. The artifacting is also visible on PAL system, but a bit less colorful. The artifacting also only happens on an NTSC machine, if you have a PAL machine it will be b&w no matter what display or interconnect..
Hi adam242 - I'm using a 5-pin video-to-RCA cable on a CRT TV... shouldn't that work? The 'black and white' version relies on artifacting to provide color. This only works on a proper CRT monitor using a composite video connection, or a CRT TV using an RF hookup. What type of display and connection are you using, G? I think there were both versions of this game: color (graphics mode 15) and b&w (mode 8). Possibly you have the second one. I just bought a copy of the original disk on Ebay and it boots just fine, but there's no color at all - on either of my 800s (CTIA or GTIA). Can anyone help? Thanks! CHEAT MODE unlimited lives, you'll need a cracked version to start with, then find the sequence $"CE B1 4D 30 22" and change this one byte $CE to $AD. 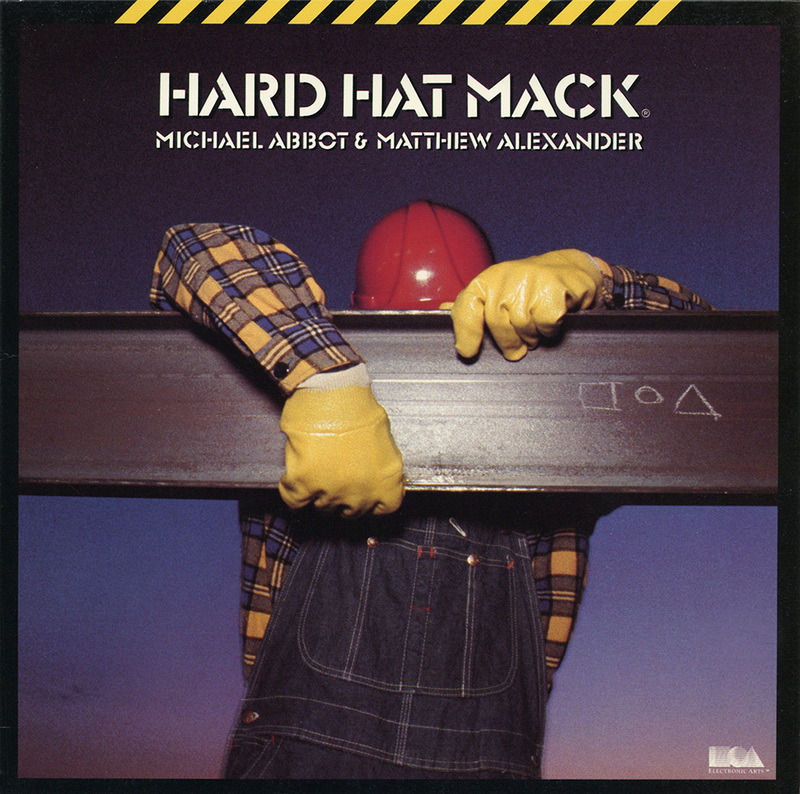 Reminder Hard Hat Mack uses artifacting in the Reverse Blue/Brown different than most software. Low resolution colour conversions of this game are all disasters. While I like the LRCC patch for Choplifter! 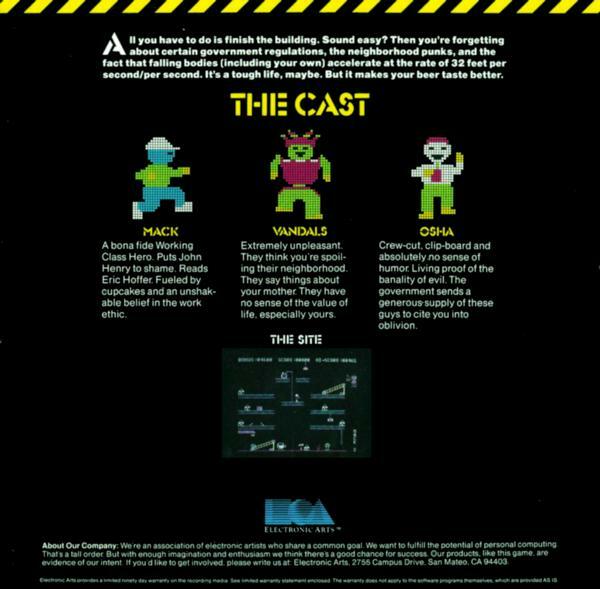 (1982), when applied to Hard Hat Mack what had been graphics rendered in beautiful detail turns into what looks like bug-squash everywhere. No matter what color. The loss of graphical definition gets hopeless. HHM in hi res is an "uncracked" VAPI disk which happens to require more than 48K RAM (XL/XE). OS/A and OS/B seem to work, but only if you supply the unusual amount of 52K RAM using an emulator. HHM in Lo res, the one I have, makes no change to the game's title screen. The load screen reads "Colour Version", and its system requirements are nearly the opposite. XL/XE never works, 48K RAM is good enough for this "cracked" version, PAL can use OS/B and OS/A, but NTSC playback of 'my' Lo res version requires OS/A. HHM is another game originally made in high resolution (320x192) with NTSC artifacting, and in addition, there exists a cheaply made (patched) low resolution (160x192) conversion as a means to circumvent artifacting for the PAL European market. Lo res HHM is not here on atarimania yet (like another game "Super Bunny"), the 2 versions presently here (US versus UK) are an exact duplicate, both in hi res. Games which have NTSC+PAL hi res and Lo res versions here now are: "Aztec" and "Aztec CS", and various files made using Pinball Construction Set, search on the genre or language being Pinball Construction Set to locate a big bunch. Also I am hoping to make "Ultima IV" (and "Ultima V") be the main HTML game pages for general comments about artifacting. HHM screenshot (on the games listing page) was captured with artifacting enabled, and the correct colors Blue/Brown, but for whatever reason, HHM was rendered in Reverse Blue/Brown and so requires Reverse artifacting playback mode to look right. Unlike this screenshot, Mack should have a brown face not blue skin, and the elevator at bottom-left should have a cold blue steel floor and a lighted orange ceiling. The guy from OSHA is supposed to have brown hair not blue, hammers have brown wooden handles. This screenshot on games page was captured in normal playback, but because HHM was recorded in reverse, everything blue/brown is switched. HHM Lo res "COLOUR VERSION" like so many other games made by/for europe, performs internally a reversal upon its original, so in this particular case, ends up with more normal coloration. OSHA gets brown hair and Mack gets a brown face, in the Color remake. Like "Super Bunny" the makers of the Lo res version looks at the original in reverse on PAL, then they copied what they saw. But even with better colors, the Lo res version of HHM is way dare I say "ugly", everyday objects are no longer recognizable. Artifacting on whole has been horribly butchered over the years. Cover Artist(s) ? Serial ? Many thanks to Farb for dumping this disk!